Check out these 10 glamorous Hollywood inspired bridal hairstyles for your wedding reception or after wedding parties. Wedding receptions or after-wedding parties are always fun and pretty relaxed. Bride is much more comfortable on this day. On the reception party, a bride chooses to wear something which is glamorous, yet relatively less heavy. After all, it’s a day to meet and greet a smaller but newer audience. For this day, Zuri has come up with 10 gorgeous, Hollywood inspired hairstyles for straight, curly, long as well as short hair. Knotted or side chignons, elegant blow-dries (side parted, centrally parted or head upside down), side-swept bangs, loose hair with flowing waves, bouncy locks, stunning ringlets, braided buns, headband braids and puffed buns..They are all in vogue! It is all about trying out something different from what you wore in the previous ceremonies and your wedding day. Besides, everybody likes to see a diverse look on each occasion. Whether it’s a saree with a halter neck blouse, a lehenga with a strapless choli or an evening gown with a V-shaped neck, there are hairstyles to go with each one of them. 1. With a single shoulder gown, blouse or choli, it is advised to go with side-swept curls that cover the bare shoulder. Besides, it looks stylish. You can try it out on your cocktail night as well. 2. For a boat line neck, go with a high hairdo (updo). The idea is to not have hair fall on the neck or shoulders. 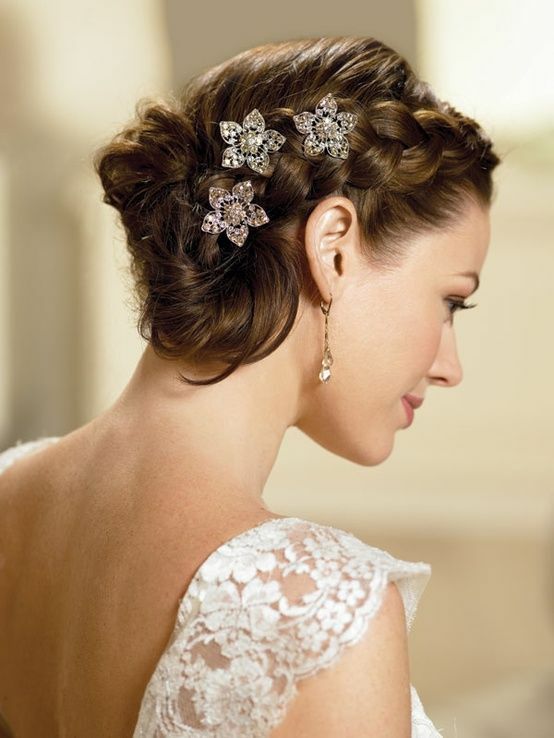 Don’t forget to accessorize your hair with a lovely floral arrangement, barrette or a few shiny bobby pins. 3. If you plan to wear a very heavy neckline, full of embellishments, then its best to flaunt your hair simple. Straight hair, side or centrally parted or perhaps some flowing waves at the end. 4. With a strapless blouse or choli, go for loose bangs or bouncy locks. If you want to flaunt some skin, opt for a high ponytail or a messy braid. 5. If your neck is V-shaped and has crystals, embroidery or lace work on it, then show-off your neck with an updo, a braided bun perhaps. Such hairstyles accentuate the neck. You must wear a gorgeous neck-piece though if the neckline has soft needlework on it. 6. With a band-neck, a high ponytail, headband braid or a stylish updo with some sparkling bobby pins or any other shiny hair accessory looks super elegant. 7. With noodle straps or cut sleeves and a low neckline, its best to go with blow-dried open hair, straight tresses or flowing waves. Wear a pretty makeup, heavy eyes, dazzling lipcolor and most importantly, a beautiful smile on your special day! Above all, have lots of fun :). Congratulations for a new beginning!